Surrey Vintage Vehicle Society caters for veteran cars, vintage cars & classic cars, as well as commercials and motorcycles. Date of 2007 London-Brighton Commercial Run ? : On May 4th. Click here for more info on the Prince Rainier Car Collection. that we can publish the photo, background story to it, and your name and country calling from. WE HAVE RECEIVED 3,500 ENQUIRIES WHICH ARE DESCRIBED IN FOLLOWING " HELP PAGES "
Photo received from Christopher Shaw (UK) of a cca 1904 Clement Tonneau which has been in his family since 1938. Last known use was by a local gas company who used it in the Darlington area to read gas meters. It then went to a farm in Yarm. His father Geoffrey Shaw purchased it from the farmer and slowly restored it, gaining the VCC dating certificate in 1947. However they have no history prior to 1938 so have contacted us with the hope that some of our readers can help. Fascinating set of photographs received from Mrs. Joan Green from Lancashire (UK). They are all from an album discovered in her late great aunt's loft. Being into family history she was hoping it was from her family from Lancashire, but they all seem to be around London and the Thames so the album may have been there when aunt moved in. The name on the album is Allvey. The car has the very distinctive tapering alligator bonnet with no sub rad. Any help would be much appreciated. Photo received from Lyn Rush (UK) found in an old box left by a relative, and asking if it is a Gladiator? The child could be her great grandmother if the dates tie up. Is there any way of finding out who the car was registered to. - Although similar bonnet, it is only the leading edge that is brass. This and other features on the front of the car suggest it is a cca 1904/5 Gamage. The 'Gamages' Store sold French Lacoste & Battman cars under own name. Reg is Middlesex, >G.London. Two nice photos received from Jill Broo (USA) which are about 8 years apart. 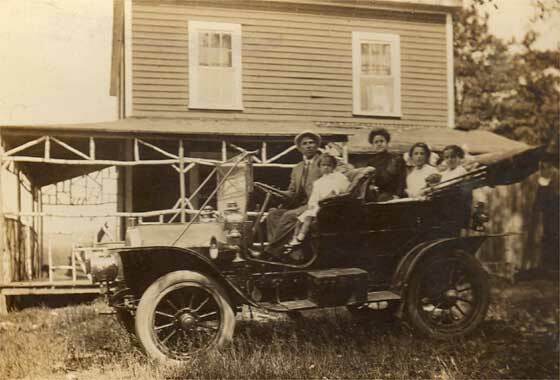 These are of her Great Grandparents and their three daughters near Springfield, Massachusetts, USA. 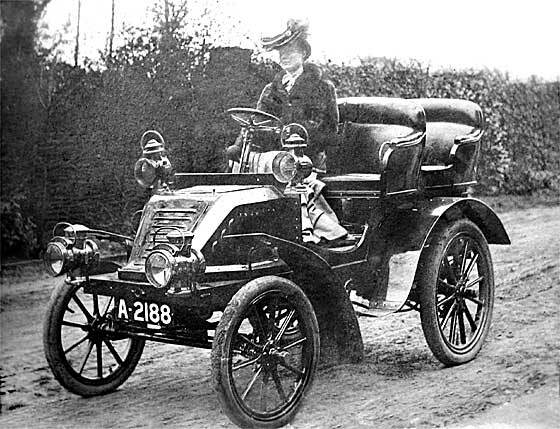 - Judging by the central wheel nuts, the front one being considerably larger than the rear, and the tall radiator filler cap, I think this photo is of a cca 1905 Stevens-Duryea. 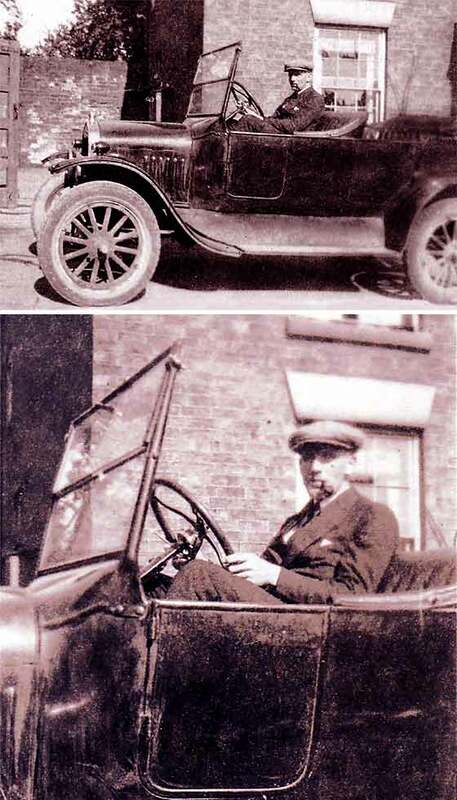 Duryea made his first car while with Hampden in Springfield and subsequently first Stevens-Duryea in nearby Chicopee Falls in 1901. Photo received from Kevin Wild, Toronto (Canada) asking for help in help in identifying the car in the photo, which was taken outside a residence in Loughborough, Leicestershire. - Although the all important radiator front is shaded over, we are relatively sure that the car is a cca 1909 Humber Tourer, probably the 12 or 15 HP. Interesting to note the broken front mudguard on which unsuccessful attempts had been made to carry out a repair. See other similar cars on earlier Help Pages. IDENTIFICATION AND DATING: cca 1909 Adler Tourer? Photo received from Christine Klima (USA) which was an old postcard she is trying to identify. The photo is very blurred and grainy, and all of the relevant identification features are out of shot, so is very difficult to identify. The only general identification feature is the flat top to the bonnet and external leavers which is very reminiscent of the German cca 1909 Adler Tourer. The setting of the photo seems to be a photographer's studio with a background scenery painted drape prop. Photo received from Sandy Steele (USA) of her grandfather (far right) when 30-40 years old, dating photo between 1923-33, and taken in Saginaw Co., Michigan. 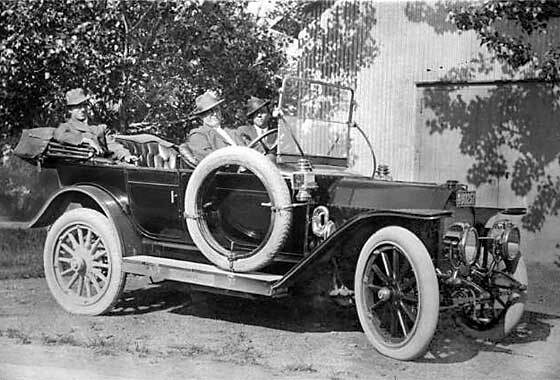 - Has taken ages to identify, but with the help of our friends at the AACA, we believe the car is a cca 1911 Stoddard-Dayton Touring. 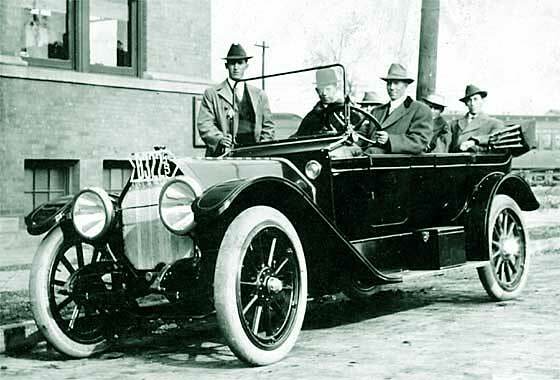 A quality competition car made in Dayton, Ohio, since 1905. 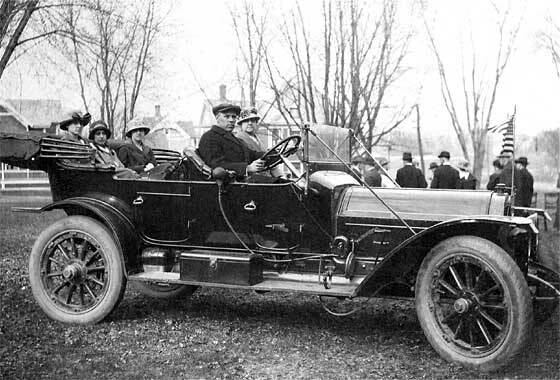 In 1912 Stoddard-Dayton became part of ill fated United States Motor Company, ....and went into receivership with them in late 1912. Cinema screen grab received from Mark Dawber (New Zealand) of a car which appeared in a 1947 film called 'Miroir' and being investigated on IMCDB. - We can advise the car was made by SA Piccard & Pictet et Cie of Switzerland. P&P initially made Hispano Suiza under licence, sold by SAG, Geneva. First Pic-Pic car was made for visit of Emperor Wilhelm II to review the Swiss Army in 1912. It had a Leon Dufor Landaulette body. Pic-Pic was known as 'Rolls Royce of Switzerland'. Closed in 1922. Lovely period photo received from Jane Shannon, Queensland (Australia). Her father-in-law is currently rebuilding a 1911 Napier. 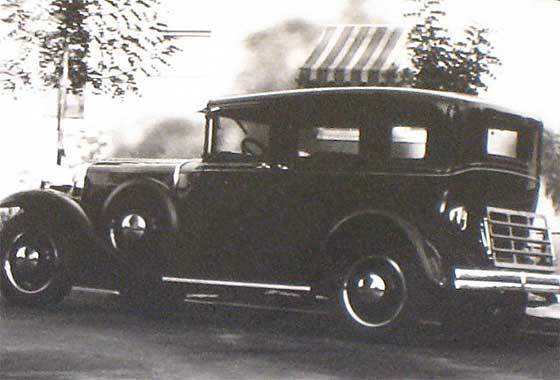 It was the first car in the Shannon family and a relative thought this photo was it, with a blurred car in the background. Not a Napier, but Peter is unsure for certain what it is. - We can advise that car in the background is a cca 1915 Model T Ford with electric lighting. 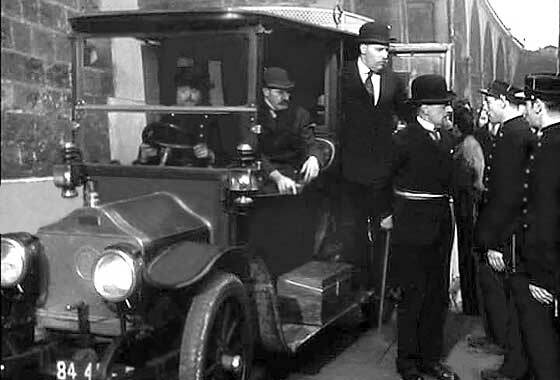 The car in foreground is a cca 1912 Talbot possibly the 15hp. Bodywork does not suggest later. Photo received from Philip Rowett (UK) from albums that belonged to his great-uncle Harold Giblett, who was employed by Vauxhall Motors between 1910 and 1914, as Chief Draughtsman to Laurence Pomeroy. The photo does not appear to be a Vauxhall. 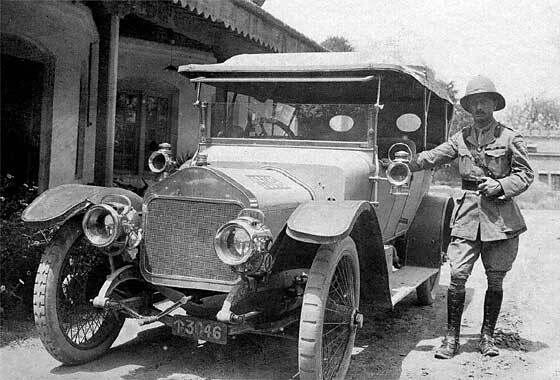 It was probably taken during the first world war; military uniform and the markings on the car. By numberplate and building behind it, was taken overseas. 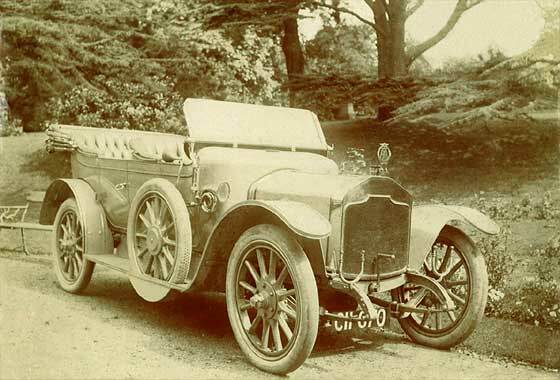 - We can advise that this is cca 1913 Wolseley Open Tourer, possibly the 16/20. Photo received from Gloria Rathbone (UK) via the Crossley Website who passed it on to us as not a Crossley. 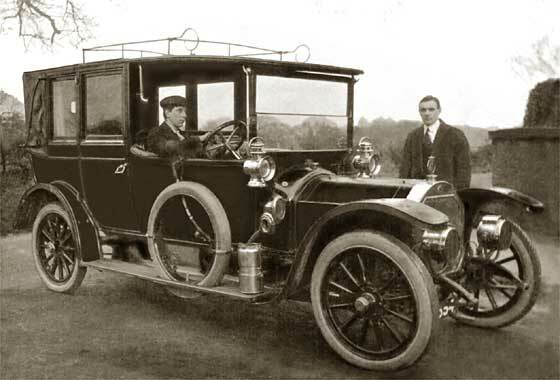 Gloria's grandfather was chauffeur to Lord Leverhulme (Lever Bros). 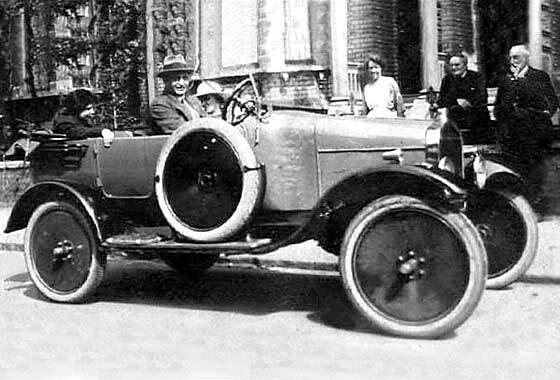 - Tony Oakes spotted that the car is a French cca 1913 Unic Landaulette. Primary identifications points: dimpled bulkhead, bulkhead water filler cap, plug on the offside bulkhead, and the bonnet rest pins along the each side of the hinge. Unic-s were also very popular in London as the primary Taxi of the day. Photo received from Mel Ogren, San Jose, California (USA) probably taken in about 1916 in Cambridge, Minnesota. This one needed the help of our friends in AACA. 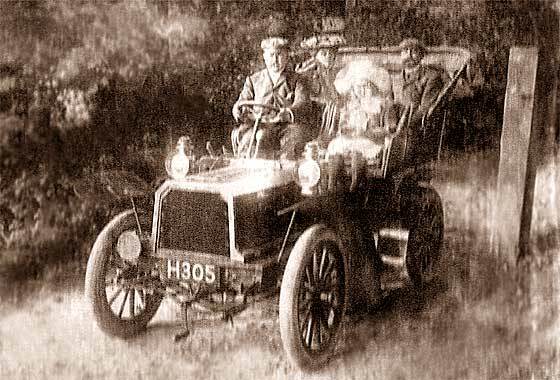 Further investigation of their suggestion seems to confirm that this is a cca 1913 Cartercar Tourer. Manufactured from 1906 to 1916 in Detroit Michigan, the company merged with Pontiac High Wheeler in 1908, becoming part of General Motors in 1909 but with death of Byron Carter, kickback from starting handle, company folded. Photo received from our own Roger Bishop (UK) who had been furkling through boxes in the loft and came across it. A lovely period snap in a very picturesque park setting. 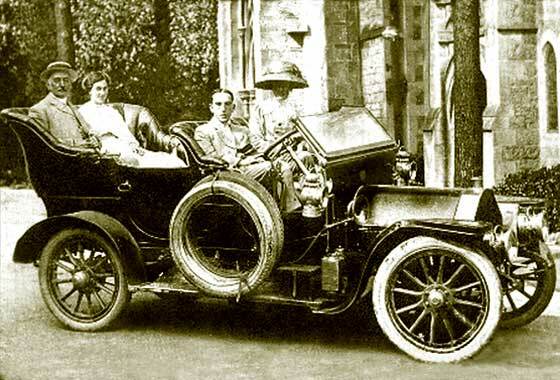 - The car is a cca 1912/13 Rover Tourer, probably the 12 HP. The numberplate is not quite clear but suggests it was issued by Derby Borough Council. The hidden numbers could make either 1912 or 1913. This must have been a popular range of cars because we have a number of these on the various of our Help Pages. Photo received from Anne Tierney Co Galway (Ireland). This picture was given to our local town historical society to see could we find the owner of the picture. Would it have been imported from England. - The car is a cca 1915 Ford Model T Tourer. Registration RI 426# was issued by County Borough Council of Dublin but unfortunately no dating is available. Brass radiator top but a curved bonnet suggest UK model. 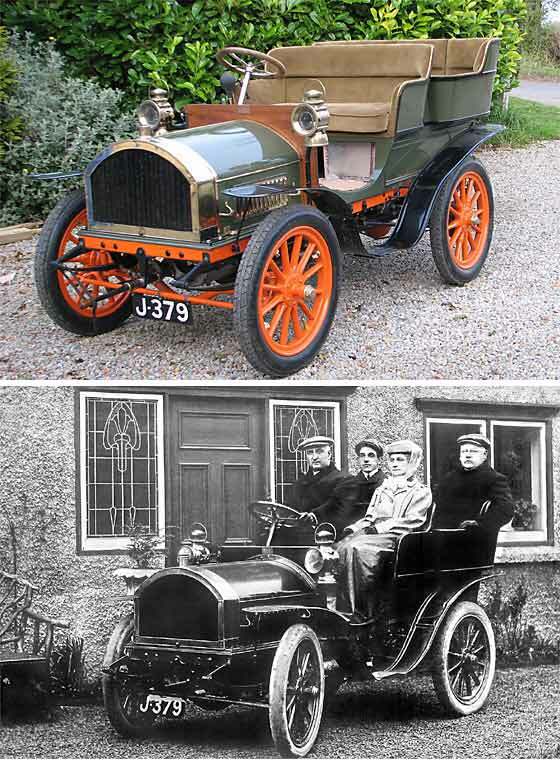 Model T-s were assembled in Trafford Park, Manchester, 1911 and 31. Second photo received from Jill Broo (USA). These are of her Great Grandparents and their three daughters near Springfield, Mass., USA. 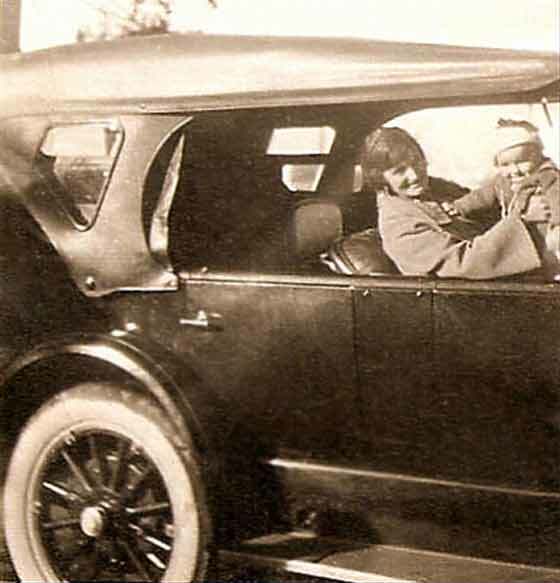 This one is dated 1917 and suggests her relatives liked their earlier car very much and therefore went out and bought the same make later. I think this is a cca 1912 Stevens-Duryea. 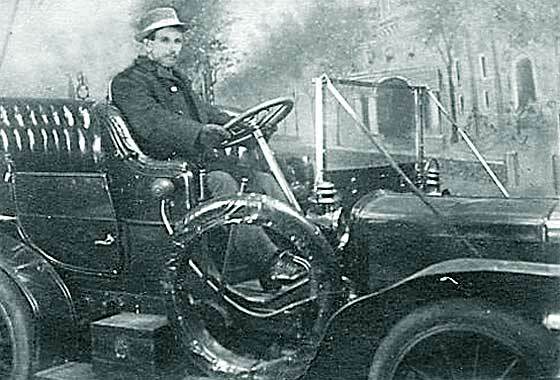 Frank Duryea amalgamated with J.Stevens Arms Co. in 1901 and made cars in nearby Chicopee Falls. Wise choice by her G.grandparents in buying locally produced car. Photo received from Rebecca Stewart Garcia (USA) saying that finding out the make and model of car may help her to identify the women and baby in the car. 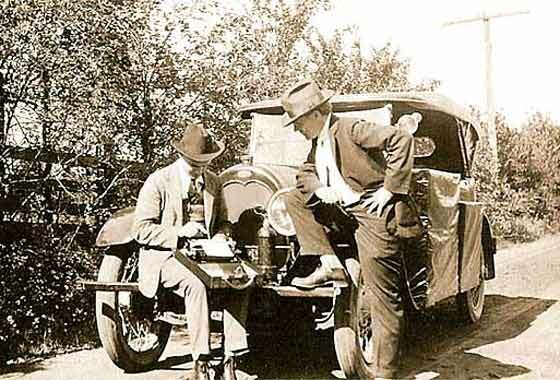 She thinks the picture may have been taken before 1924 in Sacramento, California. - This is another one that took a very long time to identify and eventually needed the help of our friends in AACA. They think this could be cca 1919 Studebaker Big Six. I have not found any pictures of similar rear side screens, so could be fter-market. Lovely period photo received from Jos Legrand, Maastricht, (Holland) whose interest is historical typewriters, but hoped we could help by identifying the car on a photo on ebay. 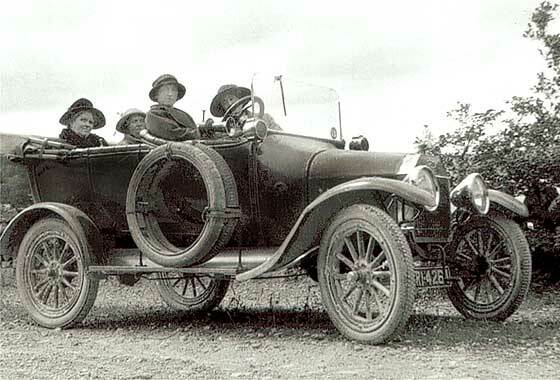 - This one is quite unusual and with assistance from our American contributor Ivan Saxton we are relatively sure is a cca 1919 Apperson 6 cylinder Tourer. Pre circular rad with rounded base. Interesting to note that it is fitted with non standard Westinghouse Air Shock Absorbers and a sprung bumper bar. Three Photos received from Brett Payne of Tauranga (New Zealand). The two on this item are showing his Grandfather Leslie Payne (1892-1975) at the wheel of a car, which he would also like identified and dated if possible, please. 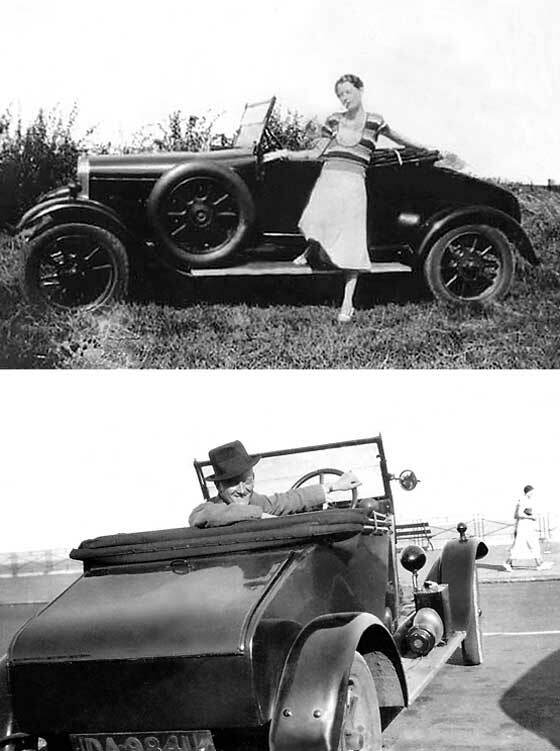 - The car in both these photos is a cca 1921 Ford Model T Open Tourer. 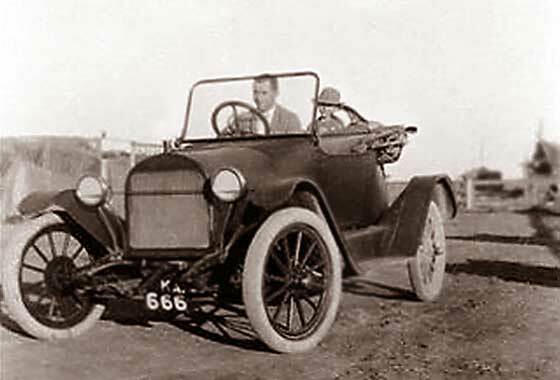 As most people know, Model T was produced in various models between 1908 to 1927 and more than 15 million Model Ts were manufactured. Manufacture in Manchester UK started in 1911. Photo received from David Hillman (UK) who has spent ages trawling the net in vain. Photo was taken in Somerset at the house where his sister now lives, originally a village school built in 1859. They are researching its history and received a picture of a R J McGregor, his family, and a car. - Reg is obscured but possibly Middlesex or Kent. Car is very interesting and unusual being a cca 1925 Ariel Nine, Four Seat Tourer (of motorcycle fame), of which about 700 were made 1922/25. Two lovely photos received from David Lavender (UK) which had initially been sent to the Crossley Website, but advised by them as not a Crossley. Photos show his mother and father. He wondered if mother had seen the Bonny & Clyde film in view of her provocative pose. 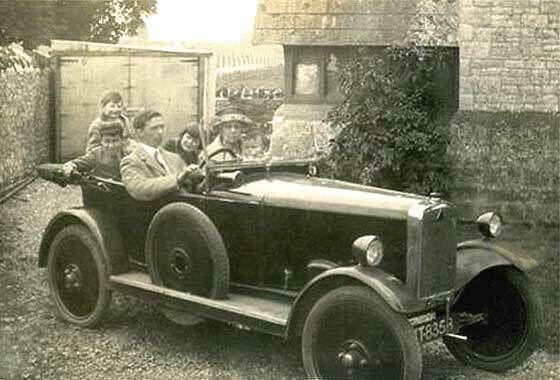 -Unlikely, as film came out in 1967 and the car is a cca 1924 Clyno 11.9. Most probably she was living through the actual Bonnie & Clyde era because they were active 1929 - 34 when photo may have been taken. 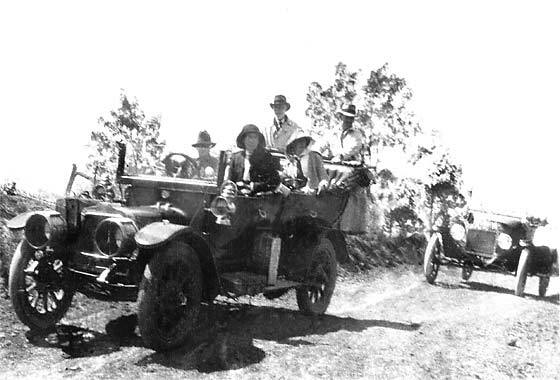 Photo received from Dave Taylor (South Africa) showing his Grandfather in his car in Kensington. The photo says about 1926. Could it be a Trojan? - Not a Trojan but a cca 1926 Ford Model T Special, probably UK assembled. 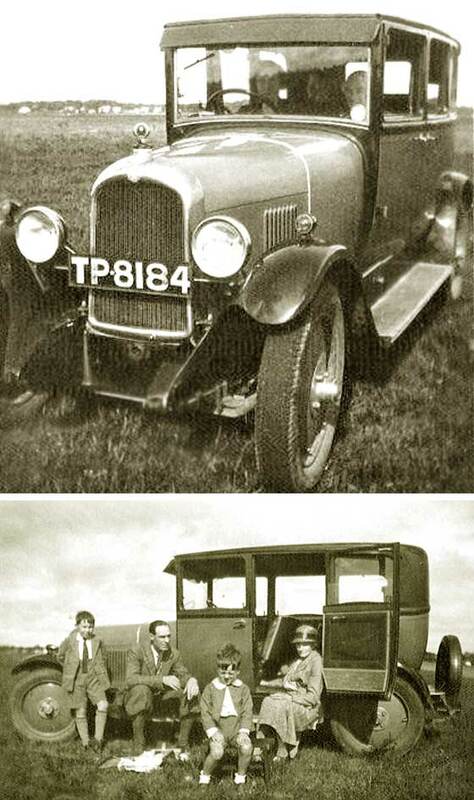 In view of so many standard Ford Ts around, people tried to make their T more individual, or not look like a T at all. Body seems unfinished with hammer marks evident on the bulkhead. Professional specials also made. Similar special, bottom Help Page 10. Photo received from David Lloyd (UK). The date of the photo could be c 1926/7 or earlier and was of his paternal grandfather, George T Lloyd. Since grandfather was in the Indian Civil Service, it is possible the photo was taken in India. - Registration is Liverpool CBC 1926. We have not been able to positively identify this car nor have our American friends at the AACA. It is not a mainstream American, so possibly a lesser make such as a cca 1926 Star, but sold in UK as Rugby, due the UK Star. Photo received from Alan Knocker, Coventry (UK) recommended to us by a friend in Germany. The picture was taken in circa 1932 somewhere in Hampshire. They lived in Portchester near Portsmouth. He is the little boy with the collar, the older boy is his brother and his Father and Grandmother complete the picture. His Father was a commercial traveller in clothing. - We can advise that this is a cca 1928 Citroen B14G. Citroen had a factory in Slough at the time. Reg is Portsmh 1929. IDENTIFICATION AND DATING: cca 1930 Graham Limousine? Photo received from Christine Klima (USA) which was an old postcard she is trying to identify. The photo is very blurred and grainy so is very difficult to identify. Only obvious feature is is the oval tail light. Our friends at the AACA suggest Marmon or Peerless but Neil Oldfield from Melbourne Australia, suggests it could be a cca 1930 Graham Special Six; taillight, the door handles, small sunvisor and big centre wires, full width bumper. Interestingly no sidelights, normally bulkhead mounted. Photo received from Kathy Rowe (Canada) taken by her uncle, who died this year at age 94; date of the slide is unknown. - Recognized as the 'Red Elephants' from recent article in motoring mag. This is a cca 1940 GM Futurliner; 33’ long, 8’ wide, 11’-7" tall with a 248" wheelbase. 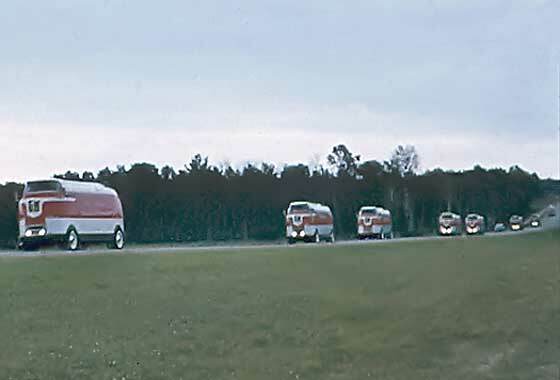 Twelve Futurliners were built and used by GM to transport the GM "Parade of Progress" show throughout the United States from 1941 to 1956. See brilliant website detailing all history and remaining vehicles. PHOTOS NOT YET IDENTIFIED: YOUR H E L P IS NEEDED PLEASE ! As can be seen from our Help Pages we normally do succeed in identifying practically all vehicle photos which we receive. Occasionally some photos may take time and very occasionally we get stuck. Clicking on the photo on the right opens the page containing some photos we are yet to crack ! Any help would be very much appreciated. Links to interesting sites: Click on any hyperlink below to be taken direct to their site. © Copyright Copying & reproduction of photographs on the Help Pages is prohibited © Copyright. The information contained in these pages has come from many different sources including books, magazines, advertisements, sales brochures, web sites, manufacturers and personal contacts. While we have tried to make sure that any information given is as accurate as possible, we cannot take responsibility for any errors or omissions. If you know of any facts which are incorrect or any subjects or details which can be elaborated on, please contact us.